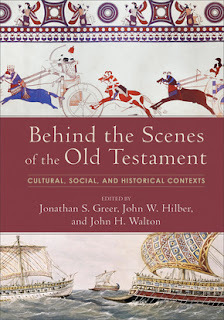 Available beginning today is an impressive-looking title published by Baker Academic, Behind the Scenes of the Old Testament: Cultural, Social, and Historical Contexts, edited by Jonathan S. Greer, John W. Hilber, and John H. Walton. The book contains 65 essays (in 640 pages) by many well-known scholars in archaeology, and biblical and Ancient Near East studies, but it also includes several younger scholars who are just beginning their careers in these various disciplines. Perusing the range of topics, it seems that little has been overlooked—iconography, geography, literature, archaeology. The opening chapters addressing historical geography and physical geography will have special appeal to readers of this blog. Essays even extend beyond the title's "Old Testament" to include Alexander the Great, the Hellenistic period, and the Hasmonean kingdom.